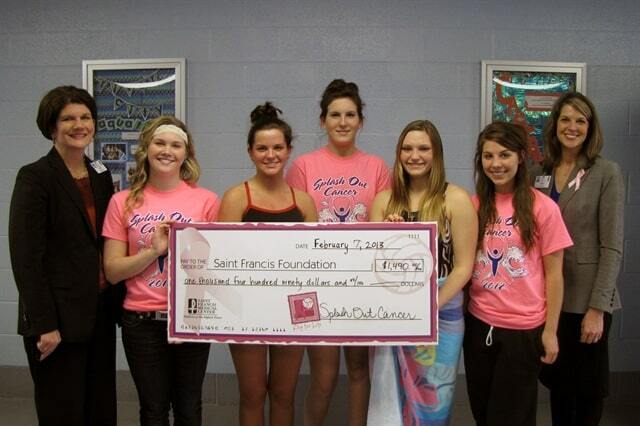 Five local high school swim teams raised $1,490 for Dig for Life, Saint Francis Medical Center’s program that provides free mammography screenings for women who otherwise could not afford them. Swim team students at Cape Central High School, Jackson High School, Poplar Bluff High School, Saxony Lutheran High School and St. Vincent de Paul High School in Perryville sold pink T-shirts for their “Splash Out Cancer” swim meet in December and selected Dig for Life as the fundraising recipient. Teams competed to sell the most shirts and raise the most money for the program; Poplar Bluff’s team finished on top this year. Events supporting Dig for Life are scheduled in October and throughout the year and are listed atwww.digforlife.com. Please visit the website or call 573-331-5133to learn more or donate to the cause.